This training programme has been designed to train employees to tackle a small fire in safety using portable fire fighting equipment. 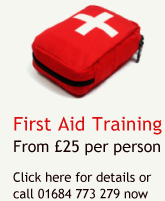 All courses include a classroom presentation and practical live fire training session. Classes of fire and fire extinguishers.